SCRAP 2019 - Swanpool & District Community Development Association Inc. Here is the Entry Form for artists to download and complete for this year's Art Prize. Just read the instructions on pages 2 and 3, complete the first page and email to us after 1 May, and before 12 July 2019. We will confirm receipt of your entry, and also advise you if your entry has been accepted, along with our bank details so you can pay the entry fee. So put on your creative cap and start thinking how you can turn waste objects into art! The 2018 Swanpool Creative Recycled Art Prize exhibition, concluded on Sunday 19th August with over 2,500 people visiting the display over the sixteen days of the event. The visitors were treated to a spectacular display of the recycling skills of many artists from around the state, southern NSW and the ACT. The winner of the $500 People’s Choice Award, sponsored by Lima South Quarry, was Michael Moerkerk from Horsham, with his work ‘Nankeen Kestrel’. The work depicts one of the smallest birds of prey in Australia, and was made from discarded lock keys and an old fence post and wire. The 2018 Swanpool Creative Recycled Art Prize winners were announced at an event launch evening on 3rd August. The guest judge, Melbourne artist, Amanda Gibson, said the judging of the 2018 SCRAP categories was a very challenging task. The exhibition has attracted entries from people who would not normally consider entering a conventional art competition. Ms. Gibson was amazed at the variety of materials used, and the manner in which the entrants had utilised these materials in producing their exhibits. Ms. Gibson stated during her exhibition summation, that the standard of works submitted was exceptional and that some works were of such a high standard that they could be displayed in galleries anywhere in the world. The 2018 SCRAP $3,500 prize winner was Tim Butler from Tatong with his entry ‘Tin Man Begs for Ore on the Yellow Cake Road’. The piece is a sculpture created from materials found when the Butler’s were undertaking renovation on their century old house. Ms Gibson remarked that the unusual use of discarded materials and equipment, made this a very strong statement piece. The following winners were also judged in the various categories, each receiving $500. The prize for best two dimensional award sponsored by Steph Ryan, went to Cathy Yarwood-Mahy from West Brunswick for her work ‘Regeneration’. This work was created from discarded iPhone covers. The prize for best large sculpture or functional item, sponsored by Peter Davis Rural, was awarded to Madelaine Last from Taggerty with her work ‘The Stag’, a metal sculpture depicting the issues surrounding wasteful hunting methods. The prize for best small sculpture or functional item sponsored by Smith Dosser and OZ Plan Financial Services, was awarded to Kate Howard from East Malvern with her work ‘Sea Creature’. This small sculpture was created with extraordinary detail and used such items as old violin strings, copper wire, paper from Venetian gift bags, broken wine glass stems and jewellery beads. The award for best recycled industrial waste sponsored by Schneider Electric, went to Rosemary Evans from Corowa for her work ‘Mesmereyes’. This is a sculpture created using the discarded pieces of metal that are created when the bolt holes are stamped into the components used in steel building frames. Swanpool Landcare sponsored a special award which was taken out by Taro Iiyama from Wangaratta with his work, ‘Last Stand of Ted’ which is a piece constructed from discarded cardboard and focusses attention on the issues facing our native wildlife. The S&DCDA Chairman’s award went to David Major from Spring Gully for his entry, a ventilated food storage box, created from a discarded wardrobe. The ‘People’s Choice’ award will be announced on 19th August and is being sponsored by Lima South Quarries. The 2018 SCRAP exhibition is on display in the Swanpool and District Memorial Hall, 2386 Midland Highway, until 19th August. The event is open from 10am until 4pm daily. The dining room is open for morning/afternoon teas and lunches at very reasonable prices. Bookings can be made on 0422 370 389. Also on display in Swanpool as part of the annual Swanpool Arts Festival is the Benalla Camera Club’s exhibition in the Swanpool Bowling Club pavilion. 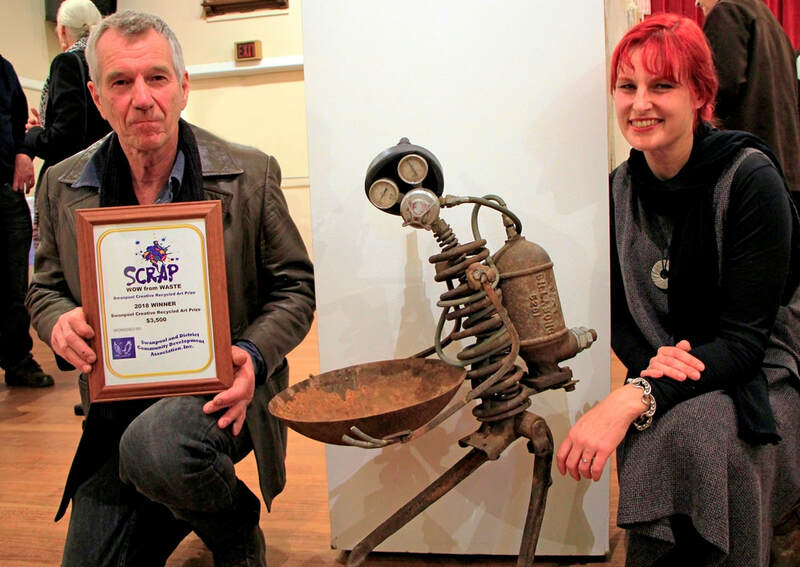 Image caption: 2018 SCRAP winner Tim Butler with guest judge Amanda Gibson. Photo courtesy of Daren Fawkes. 'Swanpool Creative Recycled Art Prize', 'Swanpool SCRAP' and 'WOW from Waste' are registered business names of the Swanpool and District Community Development Association Incorporated, and cannot be used without the express permission of the management committee.